Fabless semiconductor Realtek has been developing SSD controllers for only a few short years. Its first efforts were launched just two years back and mainly targeted the entry level PCIe drive segment. Thanks to the competitive nature of the market with big players like Samsung, Marvell, Phison and Silicon Motion being quite entrenched, its SSD controller products haven't been widely deployed. Now the Taiwanese firm is seeking another angle for penetration, looking to attract interest with high-end and mainstream SSD controllers. 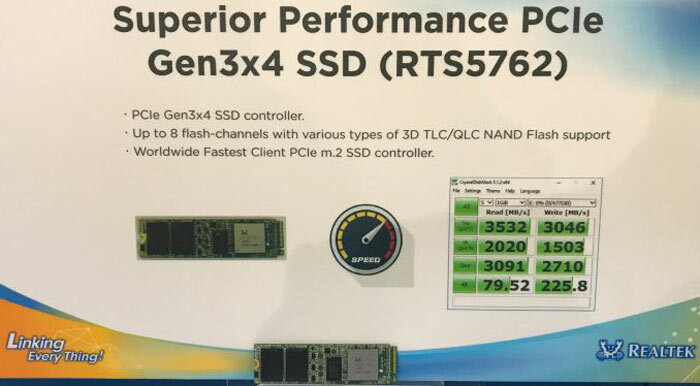 If you are going to aim high then you might as well pull out all the stops and Realtek's newest SSD controllers include one that is claimed to be the world's "fastest client PCIe M.2 SSD controller". That's the RTS5762 and AnandTech has pictures and details of the controller which was recently demonstrated at Computex. Highlights of the Realtek RTS5762 are that it is NVMe 1.3 compliant, features 8 flash channels and supports a multitude of 3D TLC and 3D QLC NAND flash memory. In terms of performance the RTS5762 is capable of up to 3500MB/s sequential read speeds as well as up to 3000MB/s write speeds - thus its write speeds best Samsung's flagship 970 PRO drive (3500MB/s reads and up to 2700MB/s writes, using pseudoSLC caching). AnandTech reveals that Realtek leveraged Toshiba’s BICS3 64-layer 3D TLC NAND. In addition to the top end RTS5762, Realtek provided an outline of the mainstream, cheaper RTS5763DL. This cuts costs by not having onboard DRAM, and it supports fewer flash channels. However it is still NVMe 1.3 compliant and supports 3D TLC and 3D QLC memory. The Realtek RTS5763DL has a PCIe 3.0 x4 interface and boasts of sequential read speeds of 2150MB/s, and sequential write speeds of 1474MB/s (when pSLC caching is used). AnandTech notes this performance is on a par with Silicon Motion’s SM2263XT-powered drives and is a big improvement on Realtek's previous gen budget SSD controllers. According to the source report, various SSD makers are putting Realtek's new controllers through its paces with an eye on product availability next year, depending upon trial outcomes, pricing and other important business factors.